One of the hardest parts of learning a language is the vocabulary. No matter how good your grammar and pronunciation, ultimately it's all down to the words you learn and can understand. And for learning words, flashcards are hard to beat. Byki Deluxe is one of the premier flashcard programs available. Taking advantage of the Mac's multimedia facilities, it includes audio files of words and phrases, a recording system to compare your pronunciation with a native speaker's, a variety of games and tests. There are also MP3 files for your iPod so you can learn and listen on the go. The French version we tested came with 153 lists for more than 2,000 words and phrases. These cover most situations and include some quite obscure words that should be new to even seasoned French speakers. Other lists, created by Byki users, are available for download. You can create your own, too. 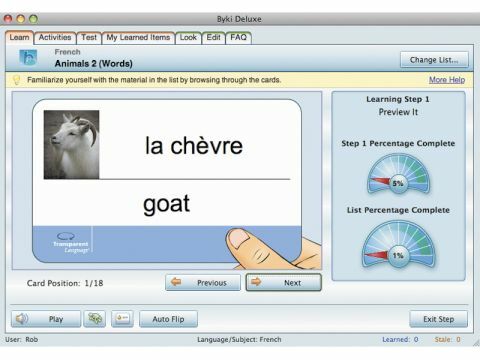 Although it's an excellent flashcard program, it's only a vocabulary tutor. There's no grammar instruction, the pronunciation tutor is a blunt instrument that's not much help in improving your spoken French, and there's no real way to build fluency or understanding of longer conversations. Although in most areas it's exceeded by its Berlitz equivalent, Byki Deluxe is available in more languages, including some obscure ones (Tuvan, anyone?). It's a useful but expensive tool for building up vocabulary.